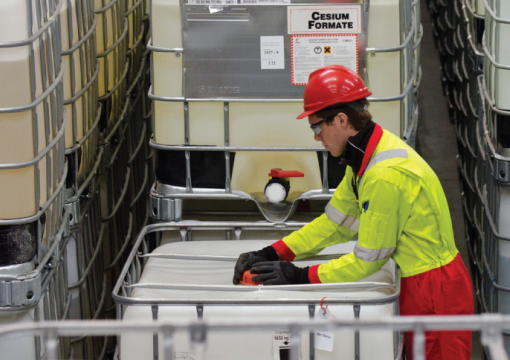 Cesium formate brine is field proven in over 350 applications. It has been used successfully in high-pressure high-temperature (HPHT) fields at temperatures as high as 235°C/455°F and pressures up to 1,126 bar/16,331 psi with no fluid-related well control incidents ever. Its unique properties deliver a number of benefits, which make it ideally suited for clear-brine applications. High-density cesium formate brine has been successfully used as a completion fluid in hundreds of wells across the world. In 2015, well engineering consultancy Ridge AS completed a study of 89 North Sea wells. Ridge concluded that formate fluids outperform other fluids to deliver significant rig-time savings for both openhole and cased and perforated completions by enabling more time-efficient solutions. Clear, non-damaging cesium formate brine creates sufficient hydrostatic pressure to provide safe, trouble-free workovers and interventions with minimal impact on the formation and downhole equipment. Our unique, high-density brine remains stable at high temperatures and effectively cleans the hole during operations. With its high thermal stability and ability to protect downhole metals against corrosion, cesium formate brine is exemplary for well suspensions, even in HPHT environments. It has been used in numerous operations worldwide at temperatures up to 235°C/455°F, including suspensions of 15 months’ duration with no adverse effects on downhole metals. High-density cesium formate brine is ideal for creating hydrostatic pressure. It lowers differential pressure across sealing elements and on the wellbore and casing to prevent collapse, and gives metals corrosion protection. Formate brines have been used as packer fluids in numerous wells from the Gulf of Mexico to the North Sea, including one documented case of formate brine left downhole for six years under pressures of 965 bar/14,000 psi and temperatures of 177°C/350°F. When the production string was finally pulled from the hole it was in excellent condition – even the identification markings on the pipe were intact. No solids, no problems. Cesium formate brine is naturally heavy cesium formate salt dissolved in water. With natural high density, our brine offers a clean and solids-free environment for problem-free operation of tools, valves and packers ensuring operations go smoothly from start to finish. Corrosion protection. Cesium formate brine is highly compatible with downhole metals. With its monovalent and alkaline properties, cesium formate brine buffered with carbonate/bicarbonate provides corrosion protection in harsh CO2 and H2S environments, even maintaining favorable pH after large influxes of acid gas. The formate ion is an antioxidant, which limits the need for oxygen scavengers and antioxidants. A high concentration of formate ions in the brine – up to 14 moles per liter – prevents problems that often occur when these additives become depleted. Furthermore, concentrated formate brines are naturally biocidal, which reduces additive costs further. Cesium formate brine’s stable nature means the risk of catastrophic, fast-acting localized corrosion associated with acidic halide brines is negligible. In over 150 HPHT applications over 15 years there have been no recorded cases of stress corrosion cracking or pitting corrosion. Safe to handle. High-density cesium formate brine is much safer to handle than alternative acidic halide brines. Rig crews work more effectively as no specialist personal protective equipment is needed. Conserving the environment. Cesium formate brine is environmentally non-damaging as the formate ion biodegrades entirely, if discharged to the sea. It meets the demanding environmental standards set by Centre for Environment, Fisheries and Aquaculture Science (CEFAS) in the United Kingdom, the Norwegian Environment Agency and other such authorities across the world. It has been used in highly sensitive environments from the Gulf of Mexico and North Sea to onshore use in Hungary and Papua New Guinea. Thermally stable and highly durable. Cesium formate brine has been safely deployed in over 150 HPHT wells at temperatures up to 235°C/455°F. It’s proved thermally stable over time with our brine successfully withstanding HPHT conditions for as long as two years. High-density cesium formate brine forms unique solids-free, non-damaging clear brines for multiple applications. Fully proven in numerous fields across the world, its remarkable properties translate into real benefits by cutting well construction costs, reducing safety and environmental risk and helping optimize revenues. The deployment of this benign brine has greatly reduced the risk of compromising well integrity and well productivity.